The development of children’s skills for reading and writing is a high priority in the school. 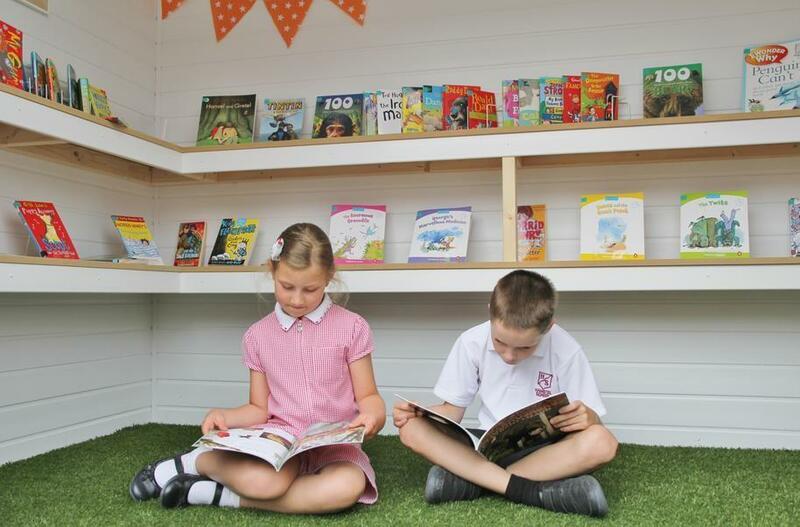 Each classroom has a book corner and the school has a well-stocked library which all children can access to promote and develop their individual tastes as readers. Lower school playground also has a Reading Beach Hut which the children can access at playtimes. The library is open to pupils at breaktimes and lunchtimes and parents are encouraged to visit the library after school with their children to help them choose books to read at home. Our library staff are on hand to help parents and children make choices and to answer questions. Our library also has a Share a Story area where parents can read with their children. Each Year 3 pupil may take two books out to read themselves (2 fiction books corresponding to that pupil’s book colour or 1 fiction and 1 non-fiction). All children should practise the reading skills they have been taught in school and they can best do this at home with a family member. Even older and more fluent children will benefit from being heard on a daily basis. Any reading that happens at home should be recorded in the Home School Diary and there are instructions for how to do this in the front of the diary. To further encourage reading as a pleasurable activity, the school runs regular competitions related to reading, organises termly author visits, book sales and hosts days dedicated just to reading (these usually involve an element of dressing up!). Throughout the year, every year group is involved in a Story Bites experience, where books are brought to life through creative activities. Expert readers can become expert writers. The school takes a Talk for Writing approach to English which uses high quality texts as models for children’s own writing. Each half term, children explore a selection of poetry, a work of fiction and a related non-fiction text. Children are encouraged to be creative in their ideas but there is also a clear emphasis on acquiring the grammar skills necessary to communicate those ideas. Presentation skills are an important part of communicating ideas; children are taught to use a fluent, joined handwriting style. Spelling is also a priority. Each week, the children explore a spelling pattern or rule and are asked to learn the spelling of sets of words as determined by the National Curriculum; details of these patterns, rules and words are sent home with the termly curriculum letters and lists of the words children need to learn are in the Home School Diary. Click on the icon below for more information about Spelling.